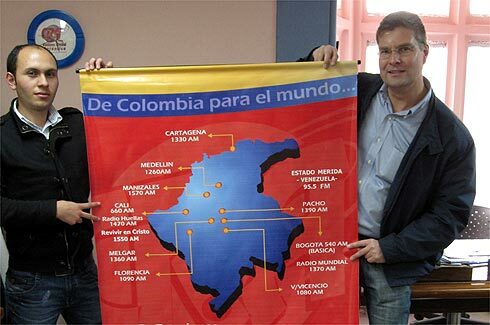 Colombia is a treasure trove for every DXer, and over the years both I and Jim Solatie have heard around 120-130 AM and shortwave stations from there. 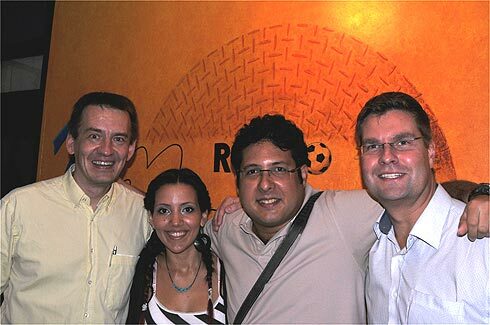 Not all of them are however overly enthusiastic about responding to reception reports, so when we got a chance to travel to Colombia in November 2011, we needed to visit a few radio stations in Bogotá and Barranquilla. Colombia was however not chosen as a winter break destination because of it's radio scene, but because Lufthansa happened to offer dirt cheap tickets  250 euros from Helsinki to Bogotá and back was an offer that we couldn't refuse. The first day was spent sightseeing in Bogotá. 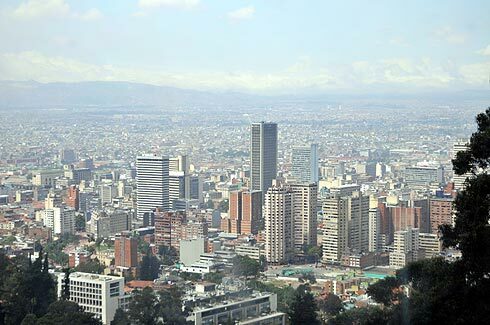 A view from the slopes of Monserrate hill to downtown during one of the few moments when it was not raining in Bogotá. The altitude of Monserrate (3150 meters above sea level) required a hefty dose of alleviation in the form of coca tea. 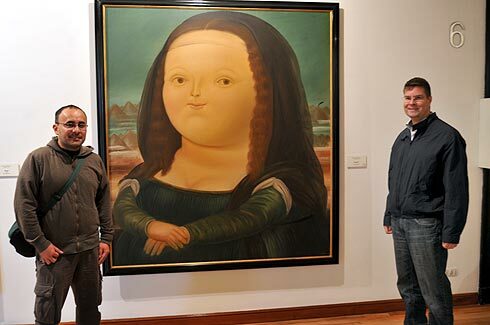 Monalisa by Fernando Botero in Museo de Botero rarely has such distinguished company: surrounded by famous Colombian DXer Rafael Rodríguez and famous Finnish DXer Jim Solatie! This building in the old Candelaria section of Bogotá houses Emisora Mariana (1400 kHz). It was a holiday, so we just admired the architecture from the outside  and sought protection from the downpour. 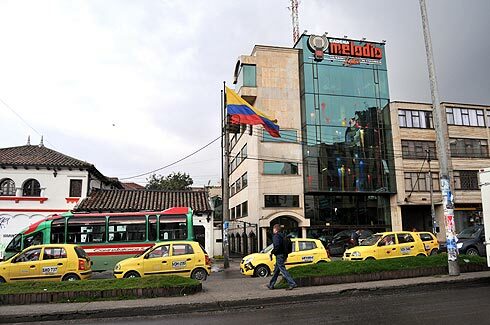 On our second day in Bogotá we started from the headquarters of Caracol Radio, occupying two floors in a modern office building at Calle 67 No. 7-37. 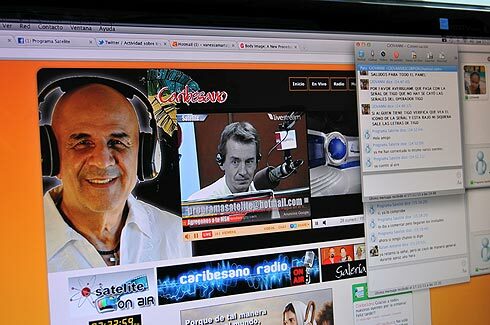 Caracol is also the home of Oxígeno Radio, W Radio and Radio Recuerdos (690 AM), as well as FM-only stations Los 40 Principales, Radioacktiva, Tropicana Estereo, Colorin Colorradio, Bésame (same company as Bésame 940 AM in Mexico City) and HJCK, which has progressed even further by abandoning FM in favor of Internet. 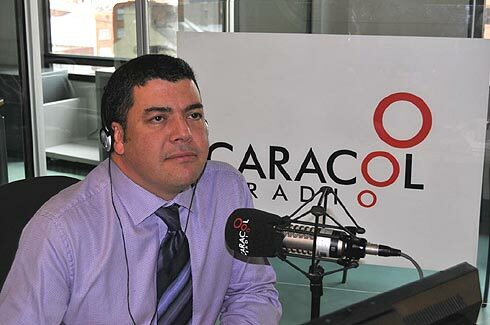 Gustavo Gómez hosts Hoy por Hoy talkshow on Caracol Radio nationwide. Hoy por Hoy is a household name also in Spain, where it is one of the flagship shows of Cadena SER. Not incidentally, both Caracol and SER are owned by Spanish media conglomerate Prisa. 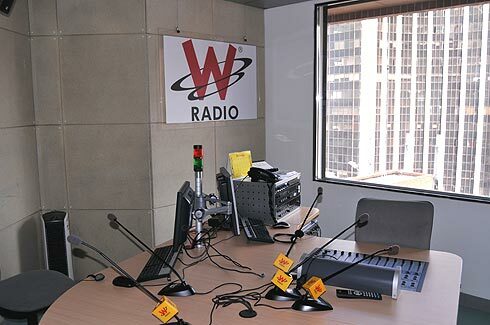 W Radio is heard in Bogotá on 850 kHz. 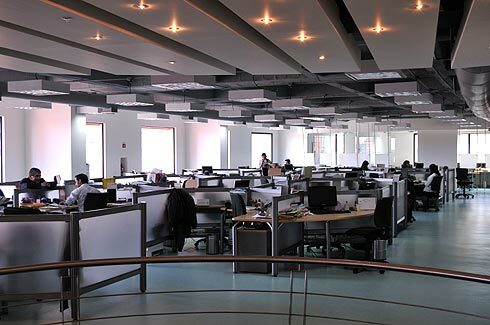 All the Caracol brands have just one studio each along the same corridor. 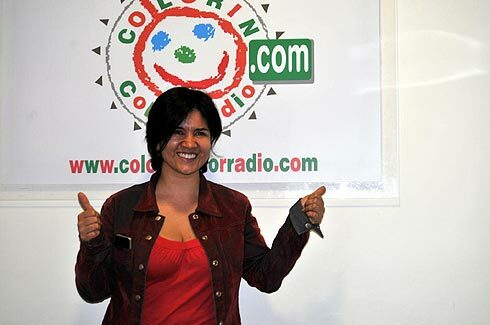 Dora Luz Moreno is coordinator for virtual content at Caracol Radio, and director of Colorin Colorradio, an FM-only station aimed for children. 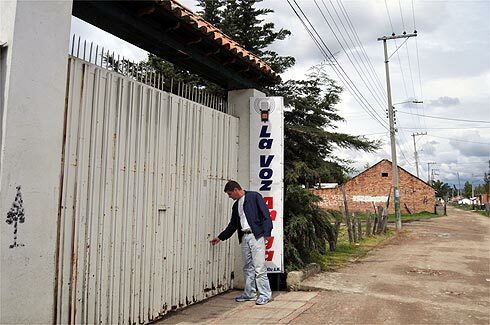 Until a few years ago the station was operated in Bogotá on 1310 kHz, a frequency which is now used by Radio Manantial. 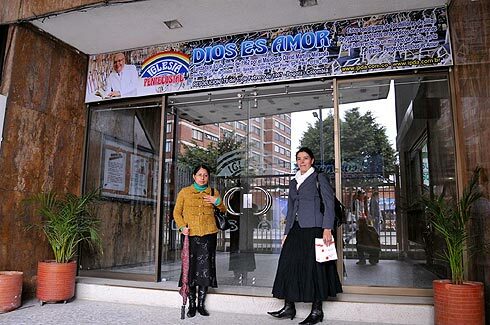 The Dios es Amor Pentecostal church in Bogotá used to run Ecos de Colombia (1160 kHz) until November 2010, but nowadays they broadcast over Radio Santa Fé (1070 kHz). 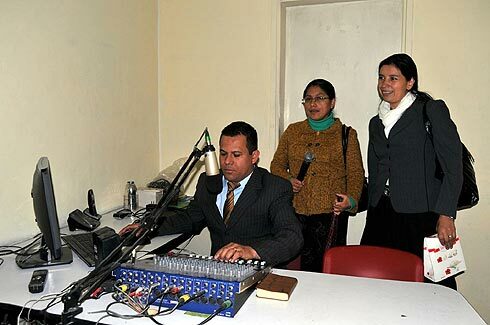 Their radio brand is known as La Voz de la Liberación (Voice of Liberation), a program that is widely heard also for example on Peruvian stations. After showing their studio, Dios es Amor personnel prayed for us to see the light. Naturally, it was a miracle of God that I had picked up their transmission halfway across the globe. On the right is Patricia Pinilla, who signed my verification card. Cadena Melodía is a family-run business just two blocks away from Dios es Amor. Note the multicolored paint spots on their glass facade. They are paint bombs thrown by students demonstrating against University tuition fees  the radio station just happened to be on the protest route. 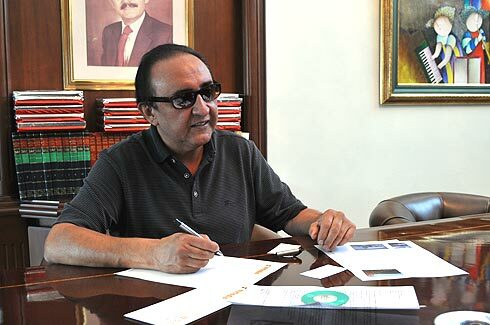 Vice President Gerardo Paez Mejia wrote us an exemplary verification letter, so he does know what DXers request, although rarely gets around to confirming reports. 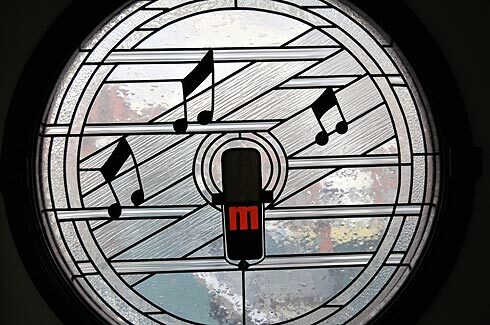 The building has been built and decorated specifically for Cadena Melodía with some impressive details, including this large window in the hallway. 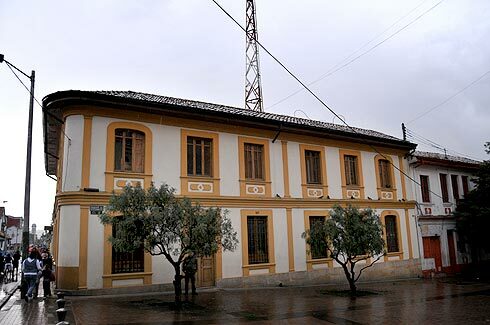 Cadena Melodía has a 100-kW transmitter on 730 kHz, but the riverfront transmitter site is flooded, so a spare 30-kW transmitter is currently used. Don't be surprised if you hear some Finnish music on Colombian radio stations, as we left a couple of CDs to every station we visited, along with some other goodies. This studio at RCN can accommodate quite a large group attending a talkshow. The modern facilities of RCN are located inside a block of old townhouses, but rain prevented any outdoor documentation of the historic premises. We saw every single studio at RCN, and there were very, very many of them. Six or seven floors full of studios, I lost count. RCN is also home to La Cariñosa. 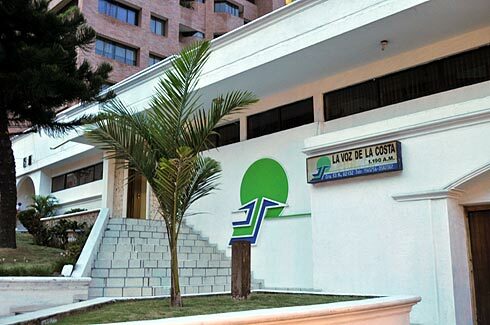 Fortunately for DXers, La Cariñosa stations air local station identifications. 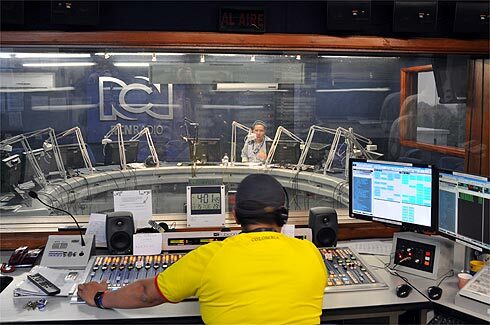 Currently, a total of 16 AM stations operate around the country, the Bogotá station on 610 kHz being the most commonly heard. 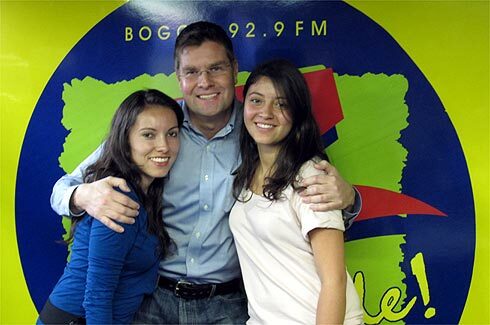 Yet another network visit in Bogotá. Gregory Montoya and Jim showing the four stations which Jim got verified this time. 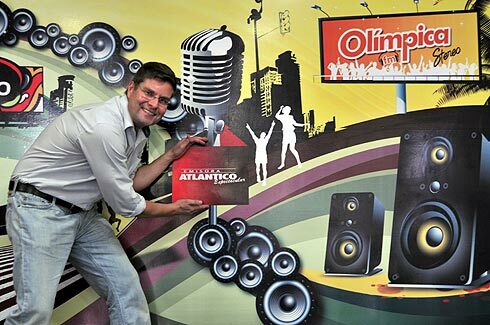 Gregory works for Cadena Radial Auténtica, whose flagship stations in Bogotá are Auténtica 540 and Mundial 1370. Visiting radio stations can be hard work. You have to greet everyone ;) Jim at Todelar and their FM salsa station La Z 92.9 MHz. After getting a taste of the beauty of Bogotá, we headed to Barranquilla  not only because the new Señorita Colombia Daniela Álvarez is a barranquillera, and was crowned two days earlier. 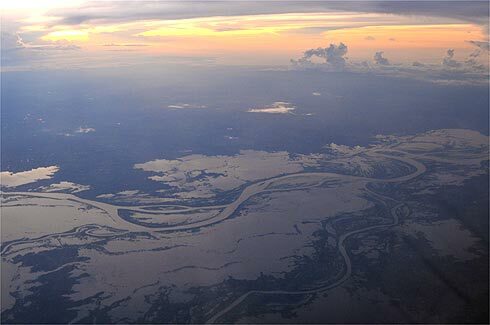 On the way, we saw the enormous floods all along the Magdalena River. By the time of our visit, the floods and landslides of the year's second rainy season had killed at least 50 people. 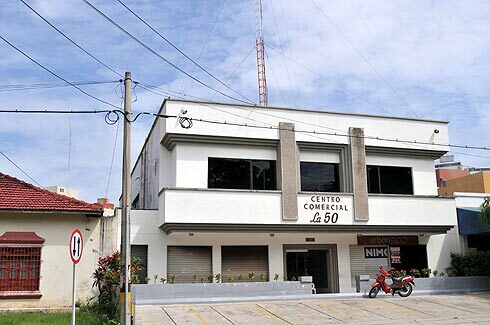 Not a single sign outside, but an antenna revealed the location of Radio Mar Caribe Internacional (870 kHz), our first radio destination just seven blocks from our hotel in Barranquilla. I arranged appointments with the big networks beforehand, but the smaller stations didn't reply to any emails, so we just showed up. 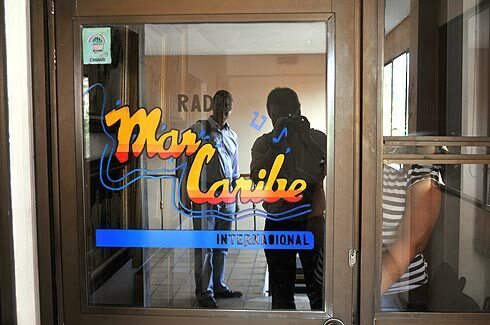 Eventually the reception was enthusiastic everywhere, but getting in to Radio Mar Caribe took some explaining. 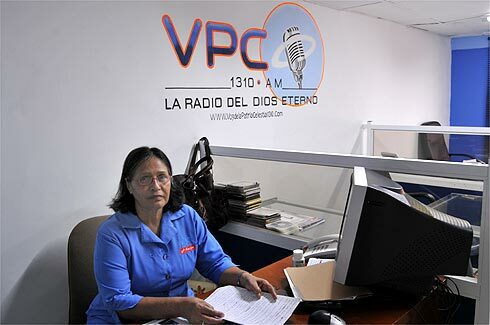 The owner of the station works as Colombian ambassador to South Africa, but gerente Celia Jimenez Gonzalez is in charge and knows how to respond to reception reports. At nearly every station we were invited to take part in the ongoing live program. Explaining DXing was fun, and our level of Spanish may have contributed to some additional unintended humor. 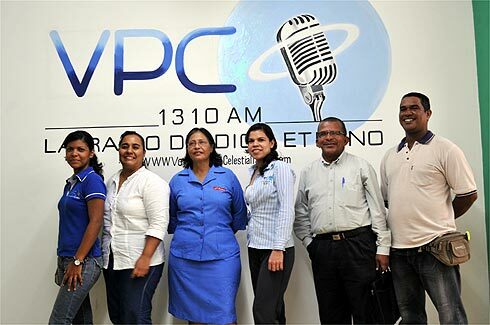 We also recorded some Spanish and Finnish language station identifications for Radio Mar Caribe Internacional "La Campeona" and a couple of other stations. 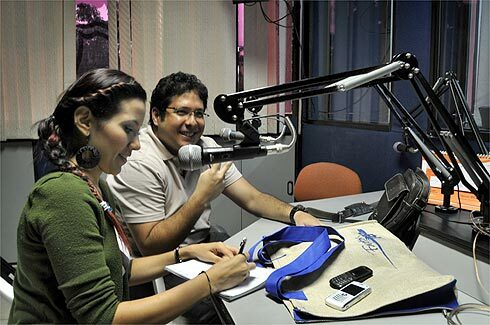 Second from left Peity Lorena Monterrosa, host of the program "Las Mujeres dicen ellos contradicen"  a program trying to give a voice to dissenting viewpoints, including the male and female perspectives to various issues. Better not to ask our spouses whether they contradicen about our Caravana por las confirmaciones, which we thought was a really cool idea and an unforgettable experience. Voz de la Patria Celestial at Carrera 45 No. 76-125 was our second stop in Barranquilla. 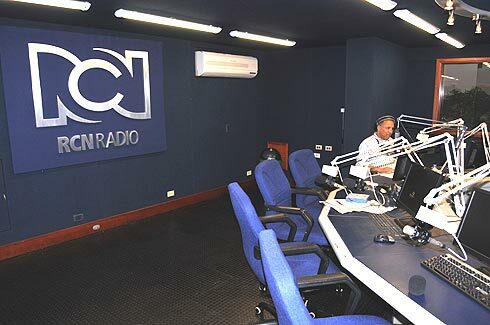 Originally this station was a newstalk-oriented Voice of the fatherland (patria), but as its current name Voice of the heavenly home suggests, it is now a thoroughly Christian station, a format that is not in short supply in Barranquilla. 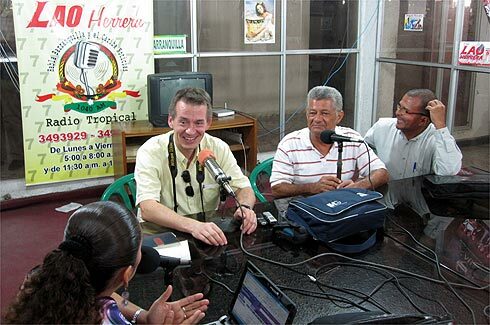 Pastor Gregorio was just ending his program on the station, and decided to join us for the rest of the day visiting other radio stations in Barranquilla. The entire management was out of town, but we still got quite a large sample of the smiling staff of Voz de la Patria Celestial. If you're nice, you just might get a QSL signed by secretary Leyla Barrios (third from right). If you're naughty like we, you might first need to pay a personal visit to the station. Looks like we're getting closer and closer to heaven, or at least up the dial. 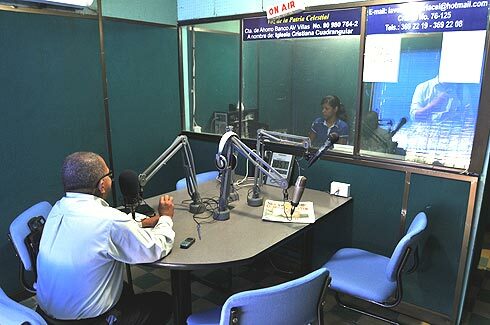 Radio Vida Nueva operates on 1490 kHz. Although it is not as common in Europe as Emisora Punto Cinco on the same frequency, also Radio Vida Nueva has occasionally made it across the Atlantic. 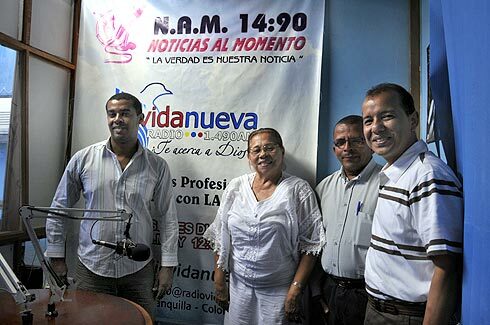 Radio Vida Nueva has developed into quite an impressive mission. 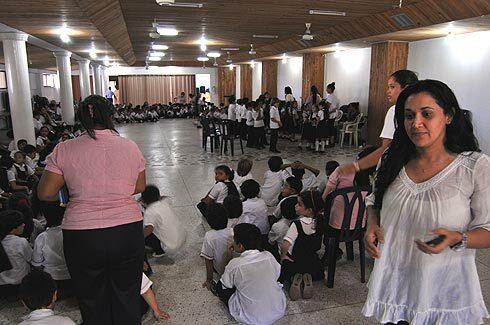 The organization runs a bilingual Spanish-English Boston International school which hopes to offer its hundreds of poor pupils quality education at an affordable cost. We even took part in one of the classes. On the right is teacher Amy Ribon, who kindly took us on a tour of Barranquilla later in the evening. 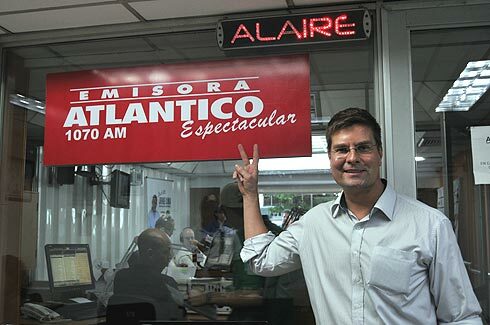 Back to secular circles, and Emisora Atlantico, the most popular AM station in Barranquilla. I already had an email QSL from years ago, but Jim scored a new point here  cause for a victory celebration. Again we were interviewed on the air, with a video streamed on their website, so by now half of barranquilleras should know that a couple of crazy Finns are visiting, and running from one radio station to another instead of enjoying the beautiful local ladies, oops, I mean the beautiful local landscape. 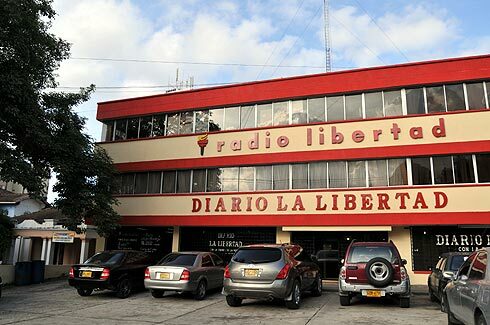 Radio Libertad (QSL missing from Jim) and Radio Tropical (QSL missing from Mika) are located in a large publishing house which doesn't look too shabby from the outside but has seen better days. The interview at Radio Tropical was particularly challenging linguistically, as in addition to DXing we talked about press freedom issues. 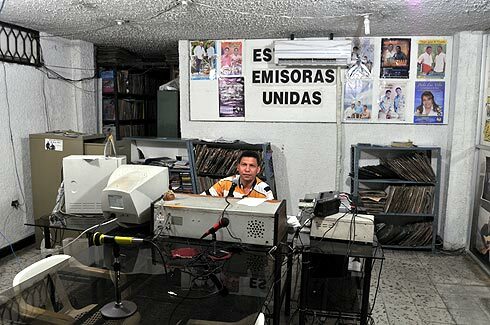 One of the many stations in the building is Emisoras Unidas, which puts out a nice signal in Barranquilla on 720 kHz, but is a terribly difficult catch in Europe. Oh well, at least we still have some challenges left in Barranquilla. The last stop of the day. 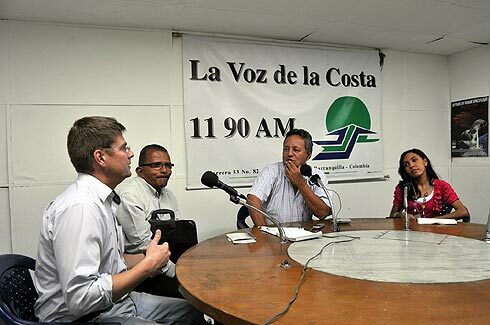 Secretary Elisa Navarro de la Hoz at La Voz de la Costa (1190 kHz) had kindly sent me a detailed and warm reply to my earlier report, but Jim's QSL was missing, so we paid a surprise visit. 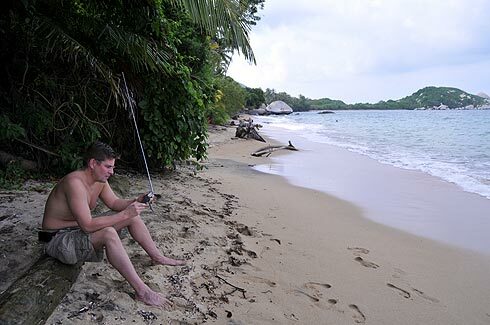 After a successful round of radio station visits, it was time to focus on the more touristy activities, such as DXing in extreme circumstances at the Caribbean Sea. Getting to this beach at the Tayrona National Park required a couple of hours of hiking through the rainforest. 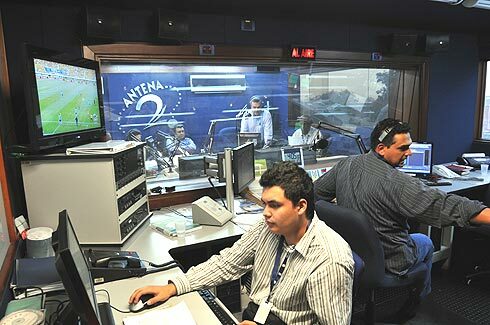 Quite a contrast to the cabin in the Finnish Lapland where we caught our Colombian AM stations! 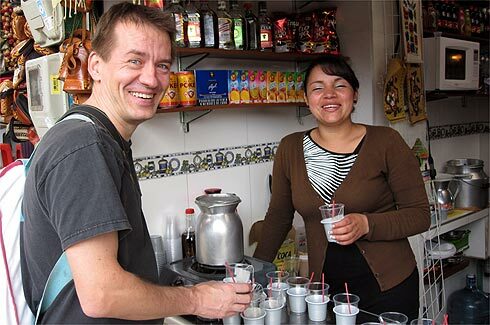 On the day of departure, we still found time to visit La Voz Amiga, Jim's rare catch in Ubaté, 100 km north of Bogotá. It was a Sunday, and nobody was at the station to open the doors, but Jim left a message and got a prompt email response. Mission completed!